No, I'm Not Talking to Myself: Monday seems like a good time for Throwback Thursday. Monday seems like a good time for Throwback Thursday. Last week I mentioned that I have procrastination issues and can never seem to do Throwback Thursday on an actual Thursday. This week is no different. 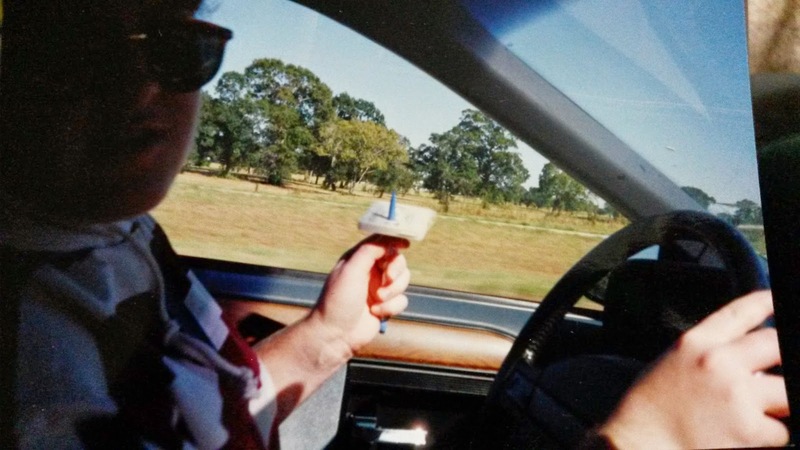 This picture was taken in the Fall of 1993 when Lori, Rick, Jake and I piled into my car to go to an APO conference on the Baylor campus in Waco. Whoever decided to let the most boring city in the Southwest Conference host an event should have been shot. Luckily, back then Xi Delta wasn't a dry chapter, so we made our own fun. For you youngsters out there who don't recognize what I'm doing in the picture, I feel sorry for you. But, I feel compelled to explain. I am using a Bic mechanical pencil to spin a cassette tape to rewind it. While driving. It was a skill that just doesn't translate to the 21st century. I should point out that it is likely that that particular cassette is Meatloaf's single "I Would Do Anything For Love (But I Won't Do That)" because I put it in and then we'd start talking and I wouldn't get to hear it, so I'd play it again. And again. Ultimately we listened to that song (or parts of it) so many times that my friends threatened to do me bodily harm. Or to walk back to College Station from Waco. Good times.